It is copyright © Bei Dao and Clayton Eshleman and Lucas Klein and Jacket magazine 2009. See our [»»] Copyright notice. steps onto a boundless deck. under each character is an abyss. believing solely in flowers from the past. please purchase this fine weather gathered by pearls. Earlier translations of these poems can be found in The August Sleepwalker (translated by Bonnie McDougall, New Directions, 1990) and Landscape Over Zero (translated by David Hinton and Yanbing Chen, New Directions, 1996). Landscape Over Zero includes the Chinese texts along with the English versions, but for “Prague,” from The August Sleepwalker, the reader of Chinese may consult Bei Dao shige ji 北岛诗歌集 (Nanhai chubanshe, 2003). Clayton Eshleman and Lucas Klein decided to offer alternatives to the McDougall and Hinton / Chen versions because they felt that, based on their knowledge of Bei Dao and his work, more accurate and substantial versions were possible. Bei Dao has given them permission to translate and to publish their versions of his poetry. 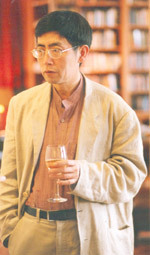 Bei Dao was born in Peking in 1949. He has lived in exile since 1989.